As the world economy shrinks and personal spendable cash across the world’s communities gets smaller, depending on your personal circumstances of course, it becomes increasingly more important to find quality malts to purchase and to know which malts that you might choose to avoid. The worst malt experience I have had is purchasing a shiny new bottle of something I had never tried because of an impulse (equals “not researched”), getting it home and having that first dram only to find that I made an awful mistake. While I concede that this does not occur very often (in fact only twice – but both still remain over half in full in vault), it is nonetheless disheartening. So in order to not make my purchase a total waste, I offer these dubious bottles to my friends who also know something of whisky. While they too find less enjoyment than normal in the bottles, they nonetheless thank me for the experience. 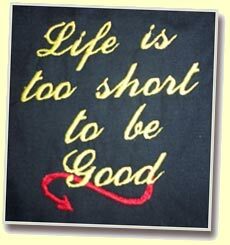 One premise I have held for many years is that ‘life is too short for bad [fill in the blank].’ However, I have recently found flaws in the rational surrounding this premise. I have discovered in my tastings that I must experience the great to know what great is. Likewise, I must also experience the ….. less-than-great (to be kind) to know what great is. To this end, I no longer discriminate with my tastings regardless of my research and my pre-conceived notions of what a malt should or should not be. For many moons, I avoided the peatier whiskies because I could not find enjoyment in them. Only after my palate had been adequately “trained” could I return to what I found somewhat repulsive and find that not only did I enjoy the peaty flavors, but in fact I have become what might be termed a “peat-head.” But then again, as Maniacs much smarter and experienced then I have said, ‘who isn’t these days?’ Thanks, Serge! There are two basic assumptions in development of a palate that can discern what you enjoy from what you do not. First, it assumes that you must taste the bad. Second, you must taste the really good. But who wants to spend say forty Dollars, Euros, Pounds or a currency equivalent on what you do not enjoy….and then have to look at that bottle every time you open your cabinet? And who can spend hundreds of dollars per bottle to get the really good stuff? Sure, there are plenty of people who still have a good deal of disposable income and they will still buy their good stuff, but for the vast majority of people these days, money is tight. Whisky clubs offer a fine method of spreading the cost amongst several individuals and present a keen opportunity to expand one’s tastings portfolio and refine one’s palate. The trouble is, so few of these clubs exist in the public forum. Most are completely private or semi-public with attendance limitations. Tastings occur at festivals and sponsored events and these certainly are worth the effort to travel to if you are able. But what about the daily dram or the monthly gathering that offers camaraderie as well as whisky enjoyment? Odds are if you have not found a club to join already, you are probably going to have to take matters into your own hands and create one yourself! For the record, Malt Maniacs is not a club. Nor are many of the societies that exist online. There are several groups that offer membership and benefits including the Scotch Malt Whisky Society (SMWS) in its various chapters, but these are hardly clubs. Fortunately for me, a couple of the more vocal and higher-profile (so to speak) clubs are here in the Southern California area. The Los Angeles Scotch Club and the Los Angeles Whisk(e)y Society (LAWS for short) are excellent examples of local clubs accomplishing exactly what they set out to do. They created a group of members that enjoy the camaraderie and really enjoy their whisk(e)y. The LA Scotch Club (www.lascotchclub.com/home) is a semi-public club (meaning open to anyone but still private and non-profit). The members and guests meet monthly to taste new bottles, discuss whisky and life, and to enjoy together the joys of a new experience. Meetings are often held in public places, bars or restaurants and the tastings are informal. Usually, three new bottles are opened and three prior bottles return from the previous meeting or meetings. Attendance usually consists of ten to twenty persons, many of which are quite knowledgeable. While there is no actual attendance limit, more than twenty persons would put a strain on the bottles to last for more than just the singular event. I do not believe that this club maintains any sort of whisky vault or reserves except for those bottles that were not finished at the prior meeting. Those usually show up at the next meeting and get kicked after the new bottles are presented and the educational discussion is finished. At that point, the members can freely sample from the bottles at their own leisure. Attendance is open to anyone who wishes to participate and the fees are quite reasonable ($20-25 for non-members; $10 for members). Actual membership is offered after an individual has attended at least three meetings and is invited to join. My own personal experience with the LA Scotch Club has been nothing but positive. The founder and Malt Master, Andy Smith, is knowledgeable and friendly and always willing to share a good dram (or bad) with a fellow enthusiast. Andy is also a member of the LA Whisk(e)y Society (LAWS). Stronachie 31yo (1976/2007 AD Ratray 52.5%); Apple pie & cinnamon spice with a balanced sweetness that was the talk of the meeting. Dufftown – Glenlivet 16yo (1979/1996 “Sherrywood” Cadenheads 57.8%) Smoke and oak mixed with sweets and spices. LAWS is a different animal altogether. The club is very private with few members presenting public profiles. Most are known on their website www.lawhiskeysociety.com by their initials only and others only by first name. Several members are higher-profile Hollywood film industry executives and would be known to most who are familiar with popular movies over the past decade or so. They seek privacy for obvious reasons and at their request they will not be named. However it should be noted, LAWS has a large database of whisk(e)y (the (e) is their club symbol and moniker – they relish in the idea that the world spells whisky without the “e” with the exception of the Irish and the Americans – but that is the subject of many an Epistle on this site and others – they spell it either way for no particular reason and at the whim of the writer) on their site and they have ratings for over 700 whiskies (Scotch, Irish, Canadian, American, Japanese, etc.). LAWS meetings are much more formal, are always held at the home of the founder, and are held in the home-bar/game room/home theater where the bar contains well over a hundred bottles of club reserves. Many of these bottles would make the most discriminating enthusiast drool with anticipation. Membership is very private and only a specific invitation from a member will gain entrance. I was fortunate enough to garner an invitation through my research for this article. The members were kind enough to accommodate my attendance at a recent meeting and I was allowed to participate as an alternate. As I said, meetings are much more formal and include a dress-code. Tastings are blind and around 5-7 bottles are served for tasting notes and the presenter for the evening (the Primary Gentleman) offers knowledge and information about the whisky or the theme in general. Some form of competition often accompanies the blind tasting (hints to match the bottles to, etc.). I must say that I found this blind tasting with the competition format most enjoyable. During the formal period, the participants are seated around a table and the bar and discuss various subjects but mostly the whisk(e)y. Many are good friends but some are new-comers. Most have decent to excellent knowledge of whisk(e)y while others are rather new to the subject. I found that the topics of discussion ranged from where to purchase whisk(e)y, to how the Lakers (NBA) were doing, to film industry issues, to why most distilleries no longer have a true maltings floor anymore. On the night of my attendance, the theme was Dufftown (the town, not the distillery) and seven bottles (this appears to be the realistic limit for a tasting in which one would swallow – after seven drams, we all began to lose some form of ability to do something) were offered for blind tastings. They ranged in value from $40 to $250 per bottle. Attendance fees per meeting vary based upon the theme and the budget set by the Primary Gentleman. This night the budget was $65 per member ($10 extra for Alternates – those who are not yet members). Attendance is limited to 14-16 persons and is priority based. While I cannot be certain of the actual numbers of members and alternates, it appeared as though there were roughly 45 total possible participants of which 15 were in attendance that night. Once the formal tasting is over, participants are free to sample from the reserves, and as I mentioned, there are some fine bottles on the shelves (such as the Macallan 18 year 1979 Gran Reserva; Lagavulin 21 year; Brora 25 year 1981 by Signatory to name just a few). Needless to say, I tasted my share of bottles that night – thanks guys! Hope to see you again soon. Pittyvaich 28yo (1979/2007 Duncan & Taylor 52.7%) Double Mint gum, tea leaves, chocolaty oak and vanilla. Mortlach 17 year (1989 Signatory 56.9%) Fresh baked pretzels, truffles, sautéed mushrooms, nuts and solid oaky goodness. All of this discussion leads us to club formation. The LA Scotch Club and the LAWS club are fine organizations and I was honored to be invited to both. The only problem I have with either club is the travel. I am from Orange County which is approximately 35 miles South of Los Angeles proper. The clubs meet in either Los Angeles proper or West Hollywood Hills and both are a considerable distance from my home. The Los Angeles area does not have a solid mass transit system that runs into the night. Therefore, I either have to limit my intake (yeah, right) or inconvenience a designated driver for several hours (thanks Honey – you’re the best!). So if I want this sort of experience on a regular basis, I have to earn a whole bunch of wife/family credits or I have to take matters into my own hands (or a combination of both – which is much more likely for me!). Private club formation is not that difficult to accomplish. It only takes a few friends with a passion for whisky and the willingness to spend some time and effort putting things together. You too can do the same thing if your goal to spread the cost of your whisky across several persons in order to experience much more variety than just what you have in your cabinet or what is available at your local bar for bar prices. First, I will assume that you would like to form a club and that you have determined that it is legal to do so in your home area (not always the case!). Next, choose a format that best suits your life-style and your goals. The two examples above are contrasting but should give you some ideas for the club guidelines. I will say, if you intend to have a vault full of quality reserves, you should definitely limit your openness to members and not just to the public. This will prevent those who have not invested in the reserves from plundering them when their only goal is to drink, not taste and enjoy. The club should have some policies and/or rules for the members and their friends to follow. Everyone should know what they are getting into. Some cash will be needed from time to time for things other than bottles (cleaning, glassware, snacks, etc.) so plan on having a petty cash stash and be sure to work in replacement funds. Ask the people you know to join you. Ask them to let their friends know. Gather a group and try things out. Eventually, everybody will find what they are comfortable with and what works best. DO NOT ALLOW DRINKING & DRIVING. Consider a breathalyzer www.breathalyzer.net for anyone who might be driving themselves and do not let anyone get behind the wheel if the thought is they might not be safe to do so! Taxis, trains, buses are usually available (Los Angeles being a notable exception). The goal is to have fun, drink responsibly, and spread the word of whisky to those who might be less maniacal. It also is an advantage to be able to spread the cost of good bottle across several persons. Everyone benefits and all can enjoy the good stuff and experience the… less than great… without having the drink the entire bottle themselves. Everyone’s currency goes further and enhances their enjoyment.